Three Summer Dramas You Don’t Want To Miss! This summer has been an absolute soap opera playing out between some of the most influential leaders of the globe. And with the stability of the future at stake, it seems prudent to familiarize everyone with the current story arcs. So this issue of BALLS will try to do just that, filling you in on the top three dramas playing out right now. President Trump is currently embattled both at home and abroad. On the domestic front, he’s dealing with the consequences of his hardline immigration policies, which were made with little thought for actual processes or repercussions. Originally a move that may have united his conservative base, it has instead fractured it. Additionally, unease among domestic companies grows as he draws up plans for his newest foreign policy salvo: escalating the trade war with pretty much every other trade partner the USA has. On the bright side, Trump’s increasingly antagonistic foreign policies have produced some truly majestic works of absurd protest. Angela Merkel, a long-time stabilizing influence in both Germany and the EU, has recently come through a rough patch that nearly split the fragile alliance holding the ruling coalition of Germany together. One of her cabinet members, Horst Seehofer, threatened to quit over the issue of migrants in Germany. A last-second compromise allowed Merkel to retain some control and keep the coalition intact. Moving forward, Merkel must find a way to balance the increasingly nationalistic attitudes of half her people with the steadfast globalism of the other half. In all fairness to Mr. Seehofer, with a name like Horst it’s difficult not to be a sinister adviser who has a deep fear of mixing cultural backgrounds. Kim Yong-chol is not well-known by the general public. But when it comes to North Korean relations with the US, South Korea, or China, Kim is the primary negotiator on behalf of the Big Kim (Jong-un). He is also suspected to be the final editor of some of the most fiery rhetoric produced by the North Korean state media outlets. Just this week, Kim (Yong-chol) met with Mike Pompeo to begin the arduous process of producing something meaningful for North Korea from the vaguely worded statement the leaders of both countries signed last month. You may remember the foreshadowing for this meeting covered in the last issue of BALLS. Pompeo is also looking for something tangible for America to capitalize on. 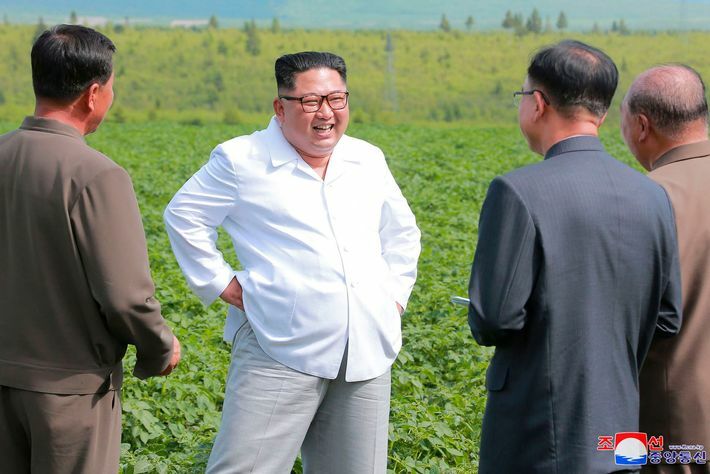 Unfortunately, the most interesting and substantial thing reporters found to focus on was the fact that during these talks, Kim Jong-un visited a potato farm. “Yup, these sure are some good spuds!” -Kim Jong-un after eating 2 raw potatoes whole in front of politely clapping aides, probably.